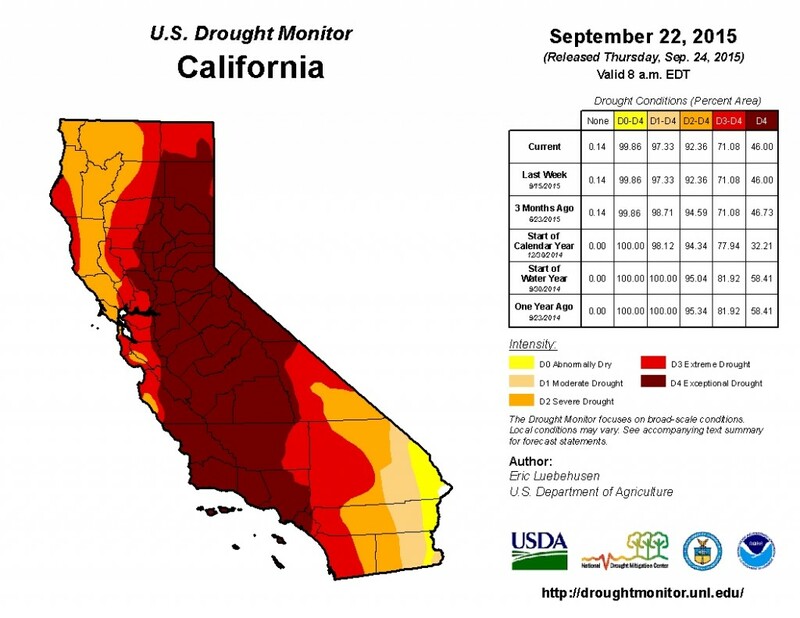 For the latest updates about the California drought go to www.californiadrought.org. Because the vast majority of precipitation typically occurs in the fall and winter, October 1st marks the start of a new water year. At 58.4°F, the 2015 water year saw the highest average temperature (more than three degrees warmer than average) in 120 years of record-keeping. The average minimum temperature in the Sierra Nevada this winter was 32.1°F, the first time it was above freezing in 120 years of record-keeping. Average precipitation was below normal in most of the state for the entire year. The April 1st snowpack was just 5% of the average since records began in 1950. 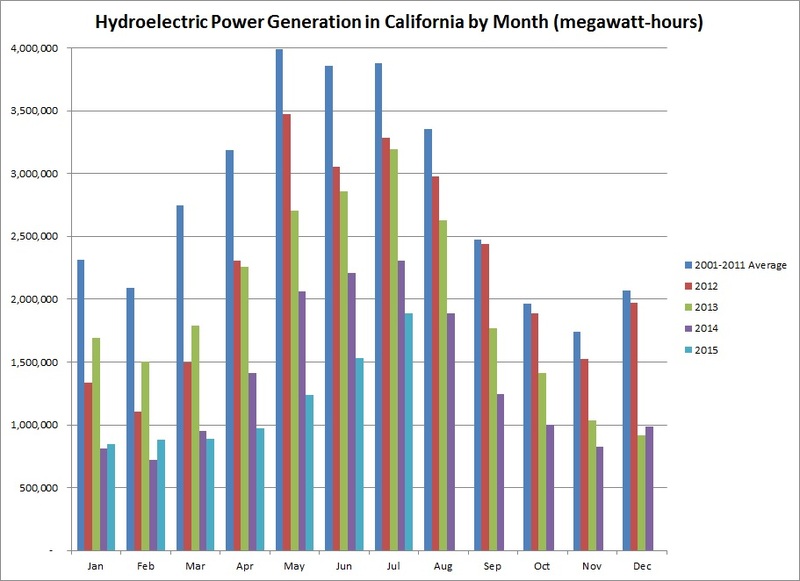 This was lower than the previous record – 25% of average – set in 1977. 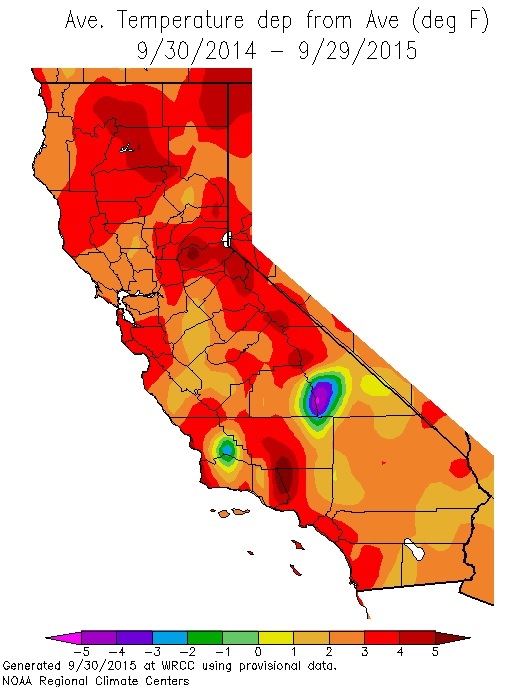 Obviously there is no way to be sure what 2016 will bring and a continuation of the current drought is still a possibility; in the past 90 years, California has experienced two six-year droughts. The entire state – from individuals up through the state government legislators – has made significant progress in the past four years. Regardless to what happens in 2016, we must all resolve to keep working towards a more sustainable water future for California – in particular, one that is resilient in the face of long-term drought. The State Water Resources Control Board lifted drought restrictions on those users with pre-1914 water rights in the Sacramento, Feather River watersheds, and the Delta. The Southern Nevada Water Authority agreed to sell 150,000 acre-feet of water to the Metropolitan Water District of Southern California, at the cost of $45 million. Drought conditions remain unchanged from two weeks ago. 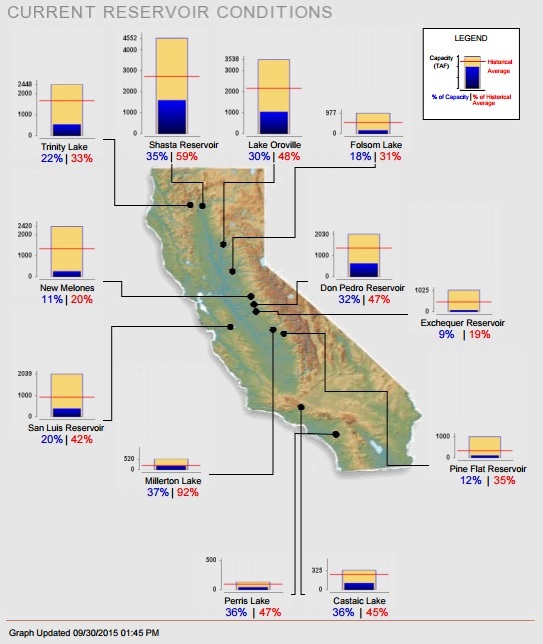 Statewide, California’s major reservoirs (representing 27.3 million acre-feet of storage) are at 28% of capacity and 49% of group average. 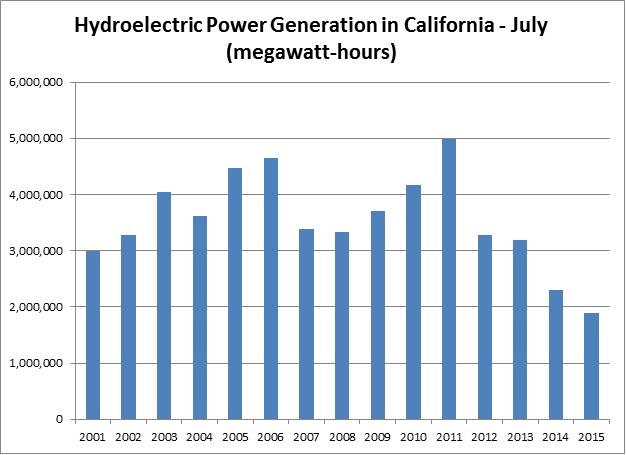 Hydroelectric power generation in July this year was 18% lower than 2014 and 52% lower than the 2003-2013 average.